Just imagine, Conor McGregor vs The Mountain, there's a fight you'd never think would happen, especially since McGregor lost his fight with Floyd Mayweather on August 26 in Las Vegas. But true to form the Irish professional mixed martial artist (and now professional boxer and $100m richer) shows he'll take on all challengers, however big they are. So true to form McGregor steps into the ring with Hafþór Júlíus Björnsson (aka. The Mountain). If you're a Game of Thrones fan (and if you're not then why the heck not?) you'll know Gregor Clegane, nicknamed "The Mountain", a huge bulk of a man feared throughout the Seven Kingdoms. You'll also know him for his skull-crushing abilities too, a fate that met at least one man he fought, Oberyn Martell. UFC Champion Conor McGregor doesn't end up with his eyes popping out of his sockets, but he still spends a few minutes sparing in the ring with The Mountain, aka Icelandic strongman Hafþór Júlíus Björnsson. Björnsson is 6ft 9" and 400 pounds while Irishman McGregor, who is UFC Interim Featherweight Champion, is 5ft 9" and 145 pounds. 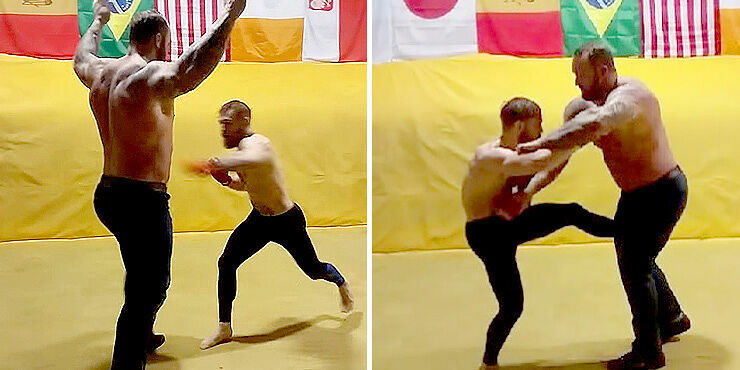 As you'll see from the 'Conor McGregor vs The Mountain' video, there's a clear difference in size between the two men. With Björnsson towering over his opponent and almost twice the width of him. He's huge. The fight is all very tame, just some gentle (for these two) sparring, but although McGregor is no doubt a guy who knows how to fight, just seeing him throw hard punches and kicks against the enormity of Björnsson makes you think if this fight was for real, his skull would be getting popped like a ripe watermelon. He's that scary. However, as i'm sure Game of Thrones fans are aware, this is no recent friendly sparring session, it all took place back in 2015 by chance when Mcgregor asked for a photo op with The Mountain. Since that fight poor Gregor was poisoned and his skull was to be sent to Sunspear in Dorne as recompense for the deaths of Elia and her children. Which is a shame as i'm sure many of us would love a Conor McGregor vs The Mountain rematch. For those who haven't seen Gregor Clegane in action and the gruesome fate of Oberyn Martell, check out the fight scene between him and The Mountain from Game of Thrones below. Warning, it gets very, very violent.